From the Plains of Marathon to downtown Athens is about 40km. The 1896 & 1904 Olympic marathon was exactly 40km. The 1900 marathon was 40.26 km or 25.02 miles. But at 1908 London Olympics, Queen Victoria Edward VII wanted the race to start at Windsor Castle and finish at the Olympic Stadium in White City. (The 1948 Games were held in Wembley Stadium… same place as Live Aid 1985.. were you there?) That added the distance to 42.195km or 26 miles 385 yards. 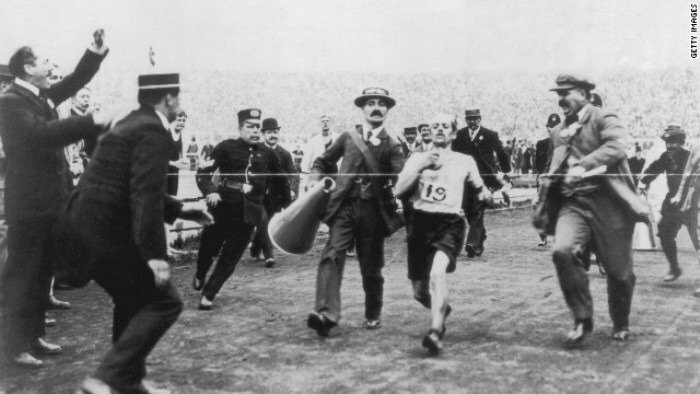 In May 1921, the IAAF made this distance the official distance of the Marathon. 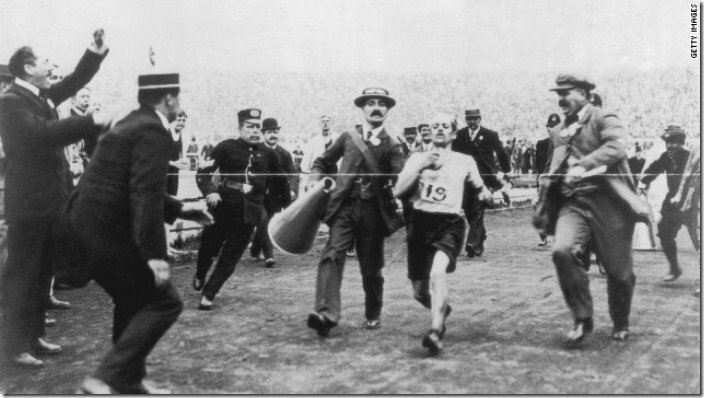 I feel bad because Dorando Pietri of Italy should have won the Olympic marathon in 1908 had the course not be lengthened, since he collapsed entering the stadium and had assistance in getting him up to finish the race. But he did receive a special honorary trophy for his heroics by the King. Maybe he felt bad? Everyone hailed the new WR last month, and full credit goes out to him and his coaching staff. But let’s not forget, the 2011 Boston Marathon had a substantial tailwind and Geoffrey Mutai (also from Kenya) won the men’s race in a time of 2:03:02. The performance was not eligible for world record status given that the course does not satisfy rules regarding 57m elevation drop. It really wasn’t about the wind. When will we see a Sub 2 Hour Marathon? There’s plenty of talk on BBC and the message boards of Mo Farah wishing to be the first man to break 2 hours for the marathon. Well, if it weren’t for Queen Victoria changing the distance, we would have a sub 2 hour “marathon”, when you consider the half marathon WR is 58:23 (in 2010). And when you consider the 1999 WR was 2:05:42, that’s a 2min19sec or 139 second improvement over 14 years, or almost 10 seconds per year. Do the math, and that 2:03:23 or 203 seconds will take 20 years to achieve? To put that in context, try running a 4:35 mile (for 26 miles!) 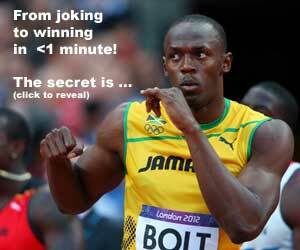 or 68 seconds for a 400m (for 105 laps!). Thanks, but no thanks, I’ll take a taxi. So yes, we will see a sub 2 hour marathon in my lifetime, just like we’ll see sub 9.50 100m and a sub 19.00 200m. With better coaching, technology, and yes, drugs, this will happen. There will be genetic freaks with a super high abnormal hematocrit level, just like Usain Bolt with his height and fast twitch fibers. Queen Victoria died in 1901, so unlikely she requested the change, and even less likely that she gave an honorary mention to Dorando!! It was Edward VII, her son and successor, who was on the throne in 1908. Yikes, I’ll have to tell Bud Greenspan to fix his video! Thanks for the history update, keeping us sharp! Re: Boston not eligible. Indirectly speaking it *is* about the wind. A valid marathon course must have it’s end points no further then 50% of race distance. One of the intents of this rule is to prevent too much of the course running in the same direction and benefitting from a tailwind.